Syedna Khuzaima Qutbuddin TUS led janaza namaaz of Juzer bhai Mulla Abdeali Najeeb at Darus Sakina on 4th Zil Hijja. Syedna TUS also bestowed doa Mubarak for the marhoom for Rehmat, Shafaa’at of Panjetan, A’immat and Do’aat and for his family for Sabar. 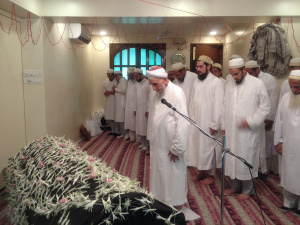 Juzer bhai was buried in the Dawoodi Bohra Qabrastaan in Kausa (Near Mumbra).